A new and unusual public bench seat has been installed on Acaster Lane. 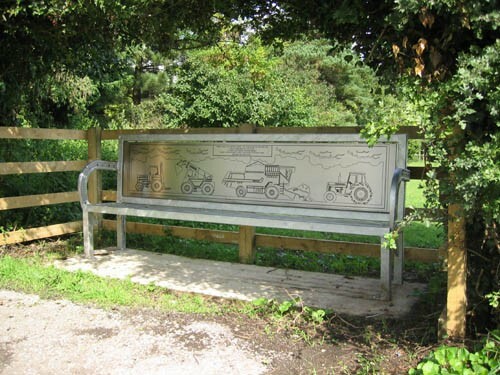 With its back to the pony field next to Redmire Cottage, the steel bench is a legacy of Paul Seward who arranged it all before his death in March 2003. It faces Canons Court, the site of Mr Seward’s agricultural machinery depot in Bishopthorpe for 30 years, and is a tribute to his workforce. The seat was constructed in the village by Paul Seward’s friend Ian Jemison, who was the first apprentice taken on by Mr Seward’s firm. The arm-rests are made from the feet of an old Ferguson plough. 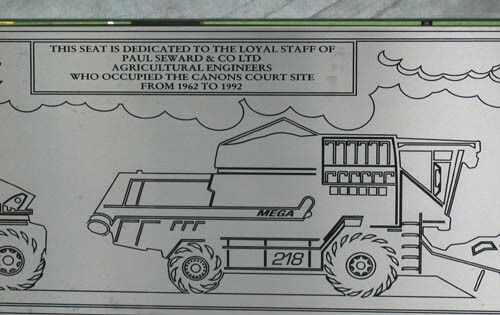 The back of the seat is engraved with drawings of tractors, a combine harvester and other farm machinery, and the inscription reads “This seat is dedicated to the loyal staff of Paul Seward & Co. Ltd, Agricultural Engineers, who occupied the Canons Court site from 1962 – 1992”.